My opinion differs depending on which of my two favourite adaptations I’m watching. They are the 1995 adaptation from Austen’s original manuscript by Sue Birtwistle and Andrew Davies and the modern-day version, Lost in Austen, by Guy Andrews. I can’t deny that both George’s are handsome, personable and look very nice in a scarlet uniform, but for me that is where the similarity ends. I must, however, give credit to two amazing actors for delivering such different versions of the same character. 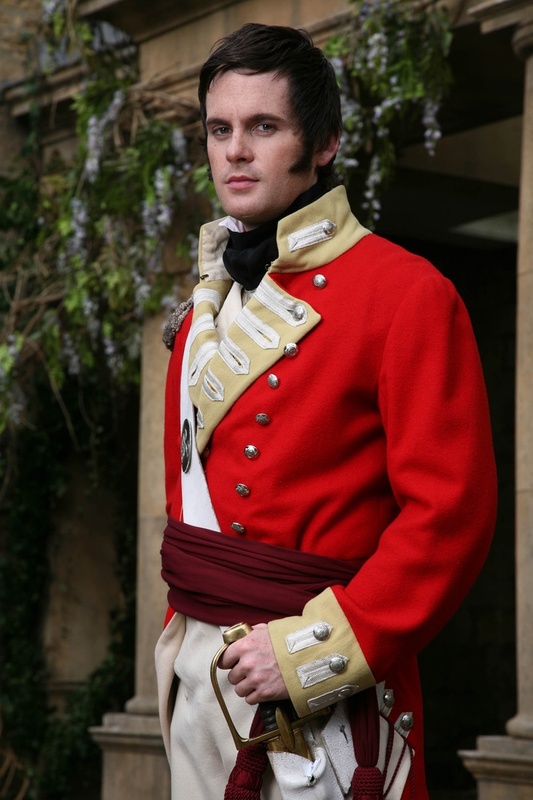 The 1995 GW was Adrian Lukis and the Lost in Austen actor was Tom Riley. Both were superb as George Wickham. 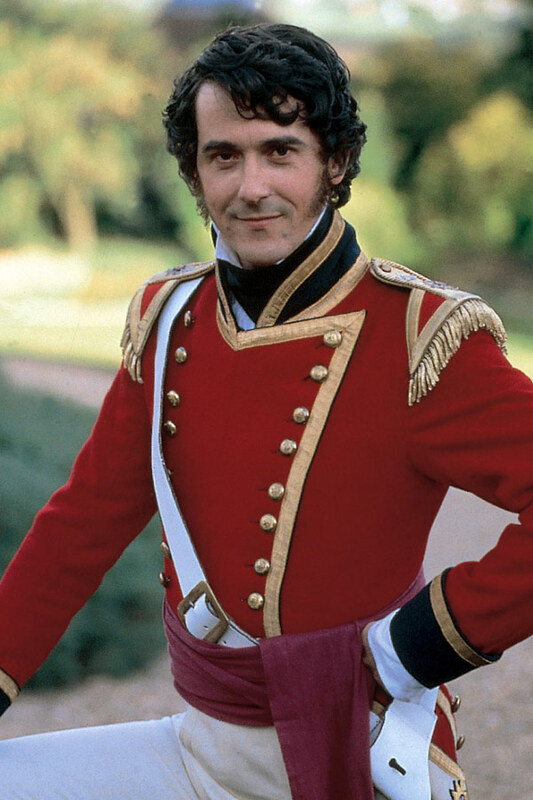 In the original I find Wickham to be a jealous, selfish cad. He’s a compulsive gambler, a liar and an accomplished despoiler of maidens. Unfortunately there is nothing in his character that I like, which is just as Austen intended. However, in Guy Andrews’s version I find I quite like George. He’s honourable, gallant and insightful, offering assistance and advice wherever he can. As the story unfolds we learn that Georgiana has persistently offered her virtue to George. He gently rebuffs her and calls her a sweet child; this obviously dents her pride and infuriates her. In retaliation for his rejection, she informs her brother that George has ravished her, and doting Darcy believes her. Poor George! He takes pity on Bingley, who is lamenting the loss of Jane to Mr Collins. He stays with him as he drowns his sorrows in the bottom of a bottle and then safely returns him to Pemberley, much to Darcy’s annoyance. After Mr Bennet is injured in a sort of duel, it’s George that comes to his rescue. As the injured man lies on the floor bleeding to death, it is George that secures the services of a village woman who has knowledge of stitching wounds. In effect he saves Mr Bennet’s life. These are not the actions of a villain but a genuinely nice human being, someone you could rely on in a crisis, someone you would be proud to call friend. Oh he is not all sweetness and like though have no fear, George certainly hasn’t lost his edge. There are times when he is more than a little mischievous. He spreads a rumour that Amanda’s wealth comes from the fish trade and then embellishes it by declaring her father has become a drunken sot and drank it all away. Untrue we know but it has repercussions in the story. I find I like the Guy Andrews George very much, almost as much as I like Darcy…..
P/s Have you read my latest book yet, I would love to know what you think. Emma is a beautiful young woman, confident within her place in society. She is popular, respected and wealthy, everything a regency lady could wish for. Eventually she realises the man she loves is none other than Mr Knightley, an old family friend and neighbour. Thankfully, he has loved her for ages and we have the proverbial happy ending we all look forward to in Jane Austen’s novels. Perfect. However, at 37 years old I find it strange that he is not already married. He’s rich, handsome and has a pleasant disposition. Why has he not been snapped up? When you consider that the average age for a rich man to marry was between 28-30 years of age, our Mr Knightley is way over the desirable age for a first time husband. Couple that with the life expectancy of a wealthy man in the early 1800’s at only 60 years old, poor Emma is likely to be a widow before her wedding bouquet hits the ground. Now I understand that he has been keen on her for a few years and was just biding his time in the hope that she would fall in love with him too, but remember he was already 16 when Emma was born. That would have made her only 12 when he should have been thinking about finding himself a wife. Surely he would not have thought of her as a prospective mate when she was not even a teenager. Now apart from a mild flirtation with Frank Churchill, Emma seems to have had no other girly crushes or suitors, something else I find strange, she is after all 21. When you take into consideration that they are among the local gentry, surely there would have been a few others gentlemen interested in her? I love Jane’s work and I understand that she was limited to what she could write, but in today’s society these are questions we would expect to find answers for. If Jane was allowed to write what she really thought, without censure from society, I wonder if she would change anything. Strong disapproval, typically on moral grounds. What a delicious word. Can you slip it into a conversation today? MR DARCY’S STRUGGLE OUT NOW!! It is with great pleasure and enormous pride I tell you that my latest novel, Mr Darcy’s Struggle is out now and available on Amazon. It will also be available in print form within the week. I hope you enjoy it and spread the word.